Hey guys! Hope you all are doing well. I’m back with another One Piece spoiler post. This post is about One Piece episode 843 release date, and spoilers. As evident this post is full of spoilers so whoever does not like to read spoilers please stay away from this post. So, without further delay let us begin. One Piece anime is the midway through the Whole Cake Island arc while in the manga Wano Country arc has begun. In the last episode we saw the Tamate Box explode and then we saw the whole of the Chateau shaking and about to collapse. This happened right when the Strawhats and Germa were about to be executed and thus the explosion saved them. All of the Chateau is collapsing and Sanji and Germa are the ones who have the responsibility to save their comrades. Luffy is going to be carried by Sanji, and Reiju, along with the rest of the Germa flies away. Ichiji is saved from Katakuri, and Niji and Yonji carry Judge with them. The Whole Cake Chateau is cut by Streusen. For someone as old as him, I think this is a wonderful feat. He doesn’t get as much credit as he deserves. Streusen then goes on to use the powers of his Kuku Kuku no Mi and turns the entire thing into whipped cream. What this does is absorb the impact of the fall, so nobody among the Big Mom Pirates even gets a scratch. Big Mom is saved by Zeus. 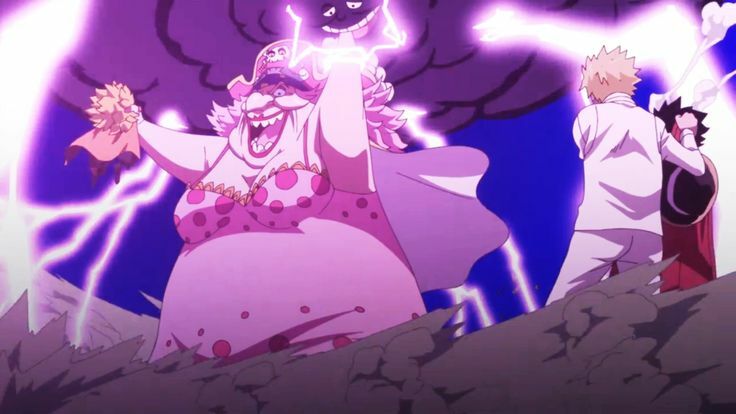 In this episode, we’ll get to see Big Mom’s disease finally showing its effects. Yes, that is correct she will be raging once again and will do so until the end of the arc. Now, in the upcoming episodes, we’ll have to bear the boring chase of Big Mom from Chateau to the Sunny. I hope this part is covered quickly in the anime. Here’s the preview for the next episode of One Piece. As you can see, Streusen is taking the center stage, and trying to save everyone. Meanwhile, Big Mom’s disease kicks in and now everyone, even her own family is in danger. Where to Watch One Piece Episode 843? There are some illegal sites like KissAnime or Gogoanime that allow you to watch One Piece for free. However, please support the official release by streaming the episode over Crunchyroll, or Funimation and help the anime community. One Piece Episode 843 release date is 01 July 2018. That is it from today’s post on One Piece episode 843. If you do not agree with the points in the post and have some of your own opinions, share them with us in the comments section down below. Keep visiting TheAnimeScrolls for more information about Anime, Manga and movies. Are you excited about One Piece episode 843 or not? Tahir Khan is the writer of “One Piece Episode 843 Release Date, Preview, Summary”. Connect with him on Social Media.